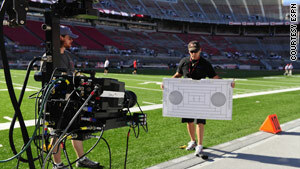 ESPN shot a September football game between USC and Ohio State in 3-D.
(CNN) -- World Cup soccer, the 2011 BCS National Championship game and dozens of other sporting events will be shown in 3-D by ESPN in the coming year. The cable network announced Tuesday that it will launch a new channel, ESPN 3D, on June 11 with its three-dimensional broadcast of a FIFA World Cup soccer match between South Africa and Mexico. In the next 12 months, the network will show at least 85 games, including the January 11, 2011, national championship and other college football games, college basketball, and ESPN's Summer X Games, according to the network. "ESPN's commitment to 3D is a win for fans and our business partners," George Bodenheimer, president of ESPN and ABC Sports, said in a news release. "ESPN 3D marries great content with new technology to enhance the fan's viewing experience and puts ESPN at the forefront of the next big advance for TV viewing." The network has been testing its 3-D technology for more than two years. In September, the University of Southern California vs. Ohio State football game was shown in 3-D in several theaters and on USC's campus by ESPN. The new network will require a 3-D television set -- a technology that is still emerging and a step ahead of high-definition -- and 3-D glasses. Initially, the channel is expected to be dark between live events. ESPN probably won't be the only player in the 3-D TV game. Industry analysts expect DirecTV to announce its plans for a three-dimensional channel this week at the Consumer Electronics Show in Las Vegas.